Material from Ezekiel 17:24, and more often 21:3 (20:47 in the English Bible) has often been cited as the source of Jesus’ saying in Luke 23:31, “If they do this when the wood is green, what will happen when it is dry?“ Other commentators have questioned this assumption. If the material was borrowed from Ezekiel, however, was it borrowed directly or was it sifted through hundreds of years of usage, only to find its way into the mouth of Jesus? The order of The Four Types usually implies ascending gradation from worst to best. When I read The Parable of the Sower, I am inclined to see the third group as representing the category in which most of us fall—including me. 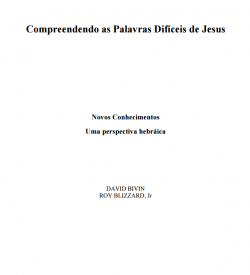 The interpretive approach of this essay assumes that Jesus’ frame of reference for the Parable of the Sower centered on the kingdom of heaven. Jesus emphasized repentance and grace, and their joint role as a catalyst for increasing God’s reign. An inherent consequence of our distance from the world of Jesus is that we primarily understand Jesus’ words as they apply within our twenty-first century eschatological and theological framework. However, Jesus’ teachings reflect his cultural background as a Jewish rabbi in first-century Galilee. Once, when Jesus and his disciples were enjoying themselves at a dinner party, a simple observation was made: “Your disciples don’t fast!” The observation was innocent and simple enough; it was not an accusation, but an honest exclamation of perplexity. Jesus’ response, however, was far from simple. 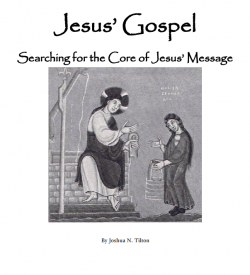 Gospel parables are probably the most widely identifiable teaching form of Jesus. 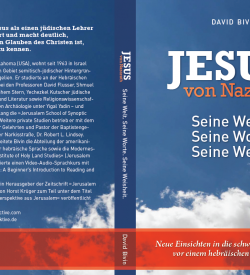 However, readers seldom recognize Jesus’ sophisticated skill as a first-century Jewish parabolist. 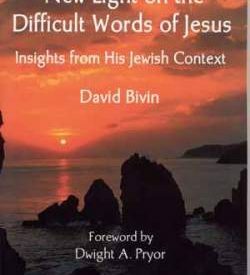 Indeed, many Christians are unaware that his use of story parables is one of the strongest links between Jesus and contemporary Jewish piety. 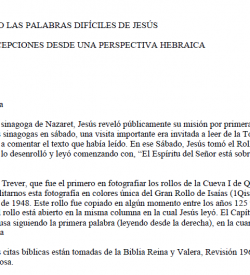 His parables also demonstrate that Jesus taught in Hebrew. Jesus’ command to “love your enemies” was revolutionary! No one before him dared to raise such a high standard for the life of faith. 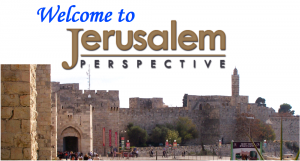 The retorts of Hillel and Jesus exemplify innovative developments in Jewish thought during the Second Temple period, developments that were established on the biblical notion that man was created in the image of God—Imago Dei (Gen. 1:27). Once while listening to some people praise the grandeur of the Temple, Jesus remarked, “The days are coming when there shall not be left here one stone upon another stone” (Lk. 21:6). Those who heard his sober remark could not help but to ask, “When will this be, and what will be the sign when this is about to take place?” Jesus’ answer to these questions is found in Luke 21:8-9, 20-24 and 28-31. Often Christians have missed the thrust of Jesus’ concluding parable about the fig tree (Lk. 21:29-31), because it includes a sophisticated Hebrew wordplay and is intricately interwoven with first-century Jewish ideas. Here, I hope to shed light on both the ingenuity of Jesus’ answer to the questions about the Temple’s demise and the meaning of his message of hope. The Jericho Road is no more than a thirty-minute drive from where we live. Yet the story of the Good Samaritan (Luke 10:29-37) can be as distant as the period of time in which it happened. Such a dramatic experience—passing up someone in dire need—would never happen to us! But how about someone who is not in such dire need? Let’s consider someone who needs just a little help. In rabbinic parables God could be portrayed as behaving in a morally ambiguous manner: he might be a cruel slave owner or a heartless judge. In a few Lukan parables, Jesus also portrayed God as behaving scandalously. Often unsettling for modern readers, such portrayals added humorous elements to the plot and heightened the dramatic effect. In his famous Parable of the Sower, Jesus referred to seed sown in soil that was full of thistles. What did these thistles look like, and how did they succeed in choking the grain plants? The scourge of anti-Semitism has not departed from the Church. Though recently there have been encouraging signs, many Christians still harbor prejudice against Jews. The Synoptic Gospels may have helped spawn this prejudice. They may even play a continuing role in perpetuating it. Jesus gave his disciple Peter the “keys of the kingdom of heaven” and promised that whatever Peter “bound” and “loosed” on earth would be “bound” and “loosed” in heaven. What scriptural allusions lurk beneath these expressions and what are their implications? How does the Jewish literary background of Matthew 16:19 help us better appreciate Jesus’ words?